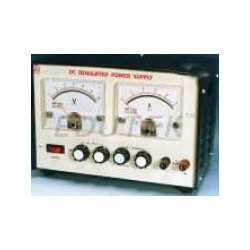 We are manufacturing all type of Electrical laboratory Instruments. 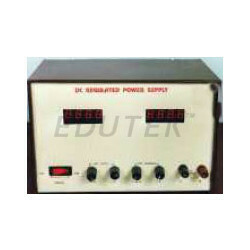 Electrical Lab Equipment are mostly use to make Electronic and Electrical Lab in Colleges. Spaced 19 mm apart Black. 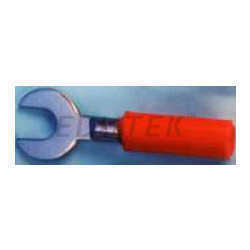 Spaced 19 mm apart Red. 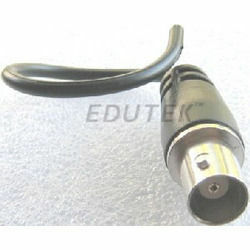 Interconnection leads, for BNC plug to 4 mm plug, fitted with strain relief sleeves, 1 metre long. With interchangeable scales. A versatile instrument and demonstration meter that can be converted to an a.c., or d.c. voltmeter or ammeter with selection of various ranges for each mode.With a high quality moving coil, spring controlled movement with full scale deflection of 5 mA or 100 mV d.c. The long pointer has a spade end and is clearly visible from a distance. Fitted in case with glass front and back. 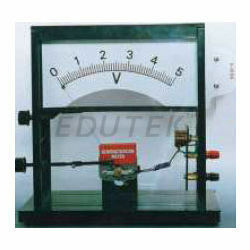 The instrument can be used with different dials to give different voltage and current ranges. All dials are interchangeable and each has a plug coupler to fit the instrument. 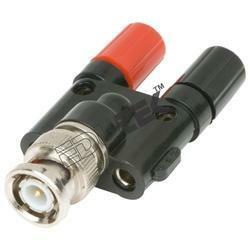 The coupler connects appropriate resistors, shunts or rectifiers to convert the instrument to the range as given on the scale of the particular dial. The scales have clear bold figures and are marked on both sides to enable the lecturer also to observe the reading from the back of the instrument. A zero adjuster allows the instrument to be used for centre zero dials.One dial of range 50-0-50 mV d.c. is supplied with the instrument. In wooden case. With interchangeable scales. A versatile instrument and demonstration meter that can be converted to an a.c., or d.c. voltmeter or ammeter with selection of various ranges for each mode.With a high quality moving coil, spring controlled movement with full scale deflection of 5 mA or 100 mV d.c. The long pointer has a spade end and is clearly visible from a distance. Fitted in case with glass front and back. 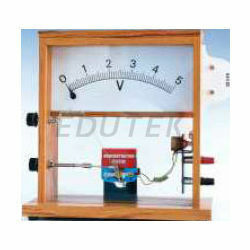 The instrument can be used with different dials to give different voltage and current ranges. 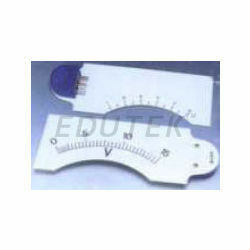 All dials are interchangeable and each has a plug coupler to fit the instrument. 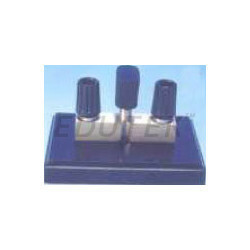 The coupler connects appropriate resistors, shunts or rectifiers to convert the instrument to the range as given on the scale of the particular dial. The scales have clear bold figures and are marked on both sides to enable the lecturer also to observe the reading from the back of the instrument. A zero adjuster allows the instrument to be used for centre zero dials.One dial of range 50-0-50 mV d.c. is supplied with the instrument. In wooden case In plastic case. 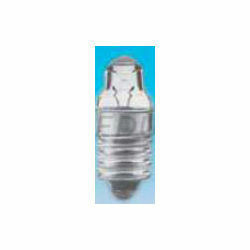 2.2 V, 0.25 A, lens end, M.E.S. cap. 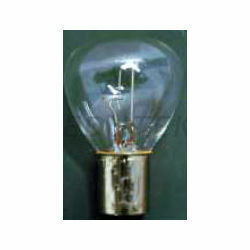 Suitable for use with reflecting galvanometer, provided with adjustment in any direction and fitted with 6 volt lamp which work on 230 volts a.c. with the help of stepdow transformer provided in base. 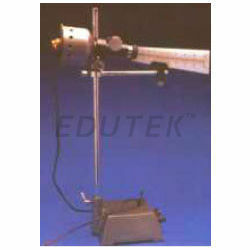 The universal lamp and scale is fitted on heavy base with chromium plated rod. Complete with perspex scale calibrated 250 - 0 - 250 mm and 0 - 500 mm. The scale carrier is of improved design permitting lateral adjustment and provides full scale view over the entire length. 4mm, with screw connection for wire and 4mm transverse hole for extra connection, moulded in flexible plastic Black. 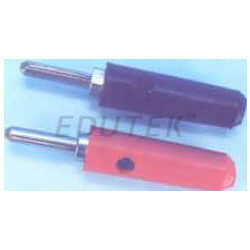 4mm, with screw connection for wire and 4mm transverse hole for extra connection, moulded in flexible plastic Red. As above but output indication is through separate analogue meters. 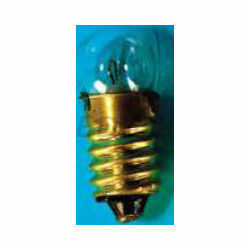 With hooked blade, insulated sleeve and screw for connection to wire, pack of ten. 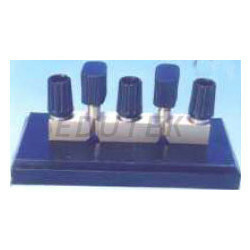 Spade shaped standard terminal with 4 mm socket connector to convert screw terminal for use with 4 mm plug connection.